Reminder: AGDQ 2017 Starts Sunday (1/8/17)! In case you forgot, consider this a reminder: AGDQ 2017 starts on Sunday, January 8th at 11:30 AM Eastern Time. AGDQ 2017 is a seven day long, non-stop speed running marathon that raises money for the Prevent Cancer Foundation. The best speed runners from around the world gather to put on the best speed running show of the year, and it all starts this weekend. Honestly, I’m so excited that I’m freaking out. I’m fine, though, because I’ll be covering the best speed runs that AGDQ 2017 has to offer right here on NintendoStar! There’s going to be tons of great runs this year, so bookmark our AGDQ coverage page to stay updated. 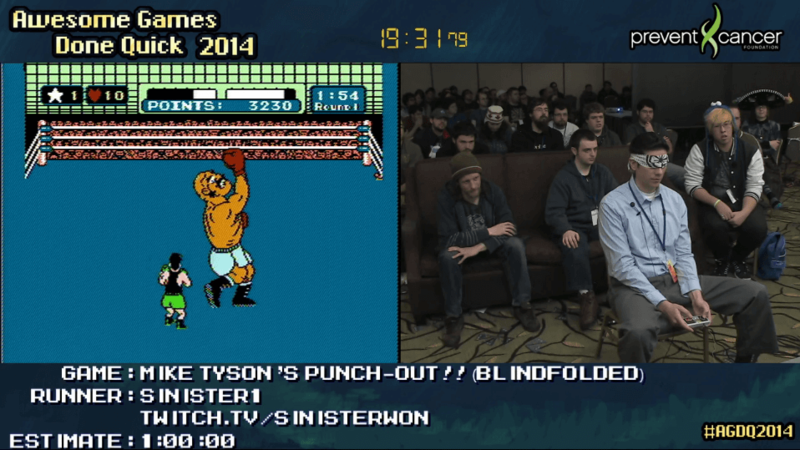 Runner Sinister1 beating Punchout… BLINDFOLDED. There’s 172 speed runs to be watched, so we won’t be covering all of them. However, fans of all different Nintendo games will get their love. There will be plenty of franchises, systems, and genres covered. For an idea of all the games being ran this year, check out the official schedule. If you’ve never seen a speed run, check out the announcement article to familiarize yourself with community lingo and check out some of the coolest runs ever (the video for the picture above, included)!